Disused and derelict behind scaffolding on Union Street lie the iconic and once marvellous Egyptian Halls, designed by the preeminent Scottish architect Alexander ‘Greek’ Thomson. The grade-A listed building has been in a shameful state of unoccupied degradation for the last 30 years despite being described as “a building of first importance, not simply in Glasgow or Scotland but in European terms” by the Royal Incorporation of Architects in Scotland. The Egyptian Halls were built in 1870-2, several years before the Mackintosh Building, which was partly destroyed by fire in May. In stark contrast however, there has been no reticence to use public funds for its restoration, with millions earmarked for the regeneration project from both Westminster and Holyrood. Why, then, is such a supremely unique piece of Scottish architectural excellence being left to rot, coming dangerously close to demolition? Architectural firm, the Morrison Partnership, have prepared a comprehensive restoration and conversion design which would return the Halls to their former aesthetic and commercial glory, when the façade looked as though piped on with stone icing. Planning permission and Listed Building consent have been acquired for a “shovel-ready” restoration project. Hotel group Accor have backed proposals to convert the upper floors into a 4-star, 115 bedroom hotel and there are a line of high quality businesses “queueing up” to get in the ground floor units. 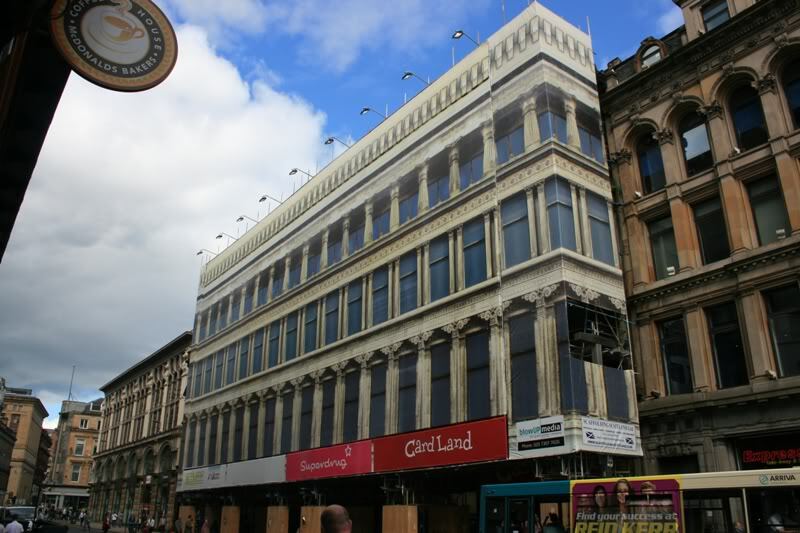 There are also plans for a permanent Greek Thomson feature on the ground floor in homage to Glasgow’s greatest. All of this could potentially create over 200 jobs, encourage new investment in the arterial thoroughfare -which connects with Glasgow’s Central Station- and generate circa £300,000 in business rates per year for the public purse. Since 1998, the building has been owned by Dundee-based Union Street Properties and Union Street Investments with Glasgow City Council, Historic Scotland and the Scottish Government all public stakeholders. Though even with this joint obligation all maintenance has been privately funded over the last 15 years as has all purchase and scheme development work –at a cost of over £7m- with “not a penny” contributed from the public purse. It is believed that the fall of Union Street property capital has contributed toward this perceived indifference, with lots of retailers relocating elsewhere over the last decade. While true, refurbishment of this lynchpin building would create jobs, encourage investment and light up a renaissance of this thoroughfare, the decline of which should not be accepted as an inevitability. Indeed, had the work been completed for a fraction of the price in 2001, this decline would unlikely have been as steep. Structural engineer John Addison published a report ‘Water: The Engine of Decay’, to highlight the corrosive effect that water ingress was having on the building. The scaffolding erected in 2009 has stopped previous collapses and is “the only meaningful way to protect the building from the elements.” Glasgow City Council has fatuously recommended “mothballing” the building. A lot of Thomson’s works have already been demolished and were his Magnum Opus to follow suit due to blinkered bureaucrats and red tape it would be devastating for a city that values its culture and heritage so highly. It would also condemn one of Glasgow’s central streets to further deterioration, when the solution to recovery is so manifestly obvious. In sum: there is an economic case, a cultural case and an historic case for this project to receive the public funding it deserves. As the great building moves incrementally toward oblivion it is worth remembering that the owners have now spent around the same amount in maintenance as the whole project would have cost in 2001.